Shanghai, China, March 23, 2016 /ChinaNewswire.com/ - Governed by Shanghai Municipal Commission of Economy and Informatization and organized by UBM China, Cloud Connect China 2016, the fourth edition of the event, will take place on 20-22 September 2016 at Shanghai International Convention Center. Composed of technical workshops, keynote speech, conference tracks and an expo, Cloud Connect China aims to thoroughly depict the current cloud computing industrial chain. During 2015-2018, the global cloud computing service market will achieve an average annual growth rate of 26%, while the Chinese market will reach a compound annual growth rate of 45% according to survey. This indicates an enormous future cloud computing market, which will bring a new round of technical revolution for enterprises. Under this background, the organizer of Cloud Connect China sincerely invites clients of old and new, to together explore the next industrial trends, business and value. Cloud Connect, founded in 2008 in Silicon Valley, was crowned as one of the Top 10 Global Cloud Computing Events. Cloud Connect China was introduced into Chinese market since 2013 and applauded for its internationality and professionalism. Now it has been successfully held for three consecutive years with growing data and more participation of domestic companies. Every September, global speakers assemble in Shanghai and share ideas with thousands of CIO, CTO, tech developers and end users from industries like finance, manufacture, E-commerce, education, medicine and etc. Meanwhile, multiple cloud results will be presented at the Expo floor. 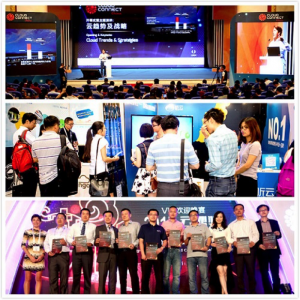 The growing participants (1575 in 2013 and 3069 in 2015) have qualified Cloud Connect China one of the largest cloud computing events in China. The event has always focusing on the connection with IT corporations, developers and business activities. Its goal is to chart the course of cloud computing's development by bringing together enterprise IT professionals, developers, infrastructure and service providers and cloud computing innovators, and thus endow Cloud Connect China with the reputation of a leading one-stop platform for enterprise cloud. A global speaker lineup will share insights and practical cases over international cloud computing industry’s current situation and most popular areas. And the Expo will bring together over 60 domestic and foreign manufactures, showcasing the cutting-edge technology, fine products and equipment, to echo the conference tracks. In addition, Enterprise CIO Forum, the Top Cloud Connect Awards, matchmaking and other value-added service will further improve the participation value of the event. The event sponsorship, conference tickets and visitor pre-registration are already open. Sponsors may not only share and extract trend report, display latest products and technical services, but also have an all-dimensional branding chance with exposure to plenty of active buyers. To participants, it will be a perfect training opportunity and a platform to connect with peers. And they are able to have a first taste of the new-age cloud computing technical products as well. Conference Ticket: preferential system according to time period. And an extra 15% discount for 3 or more delegates to register at one time.